In a third-round tie of few clear-cut chances on Tyneside, Bowman scored the winner from close range after Rob Ramshaw’s cut-back was deflected into the striker’s path. Fylde’s best chances at Gateshead International Stadium came in the first half as both Dion Charles and Sam Finley forced saves from Heed keeper Sam Russell, but they could not break through against hosts who play a level above them. The Coasters made two changes from the team beaten at Chorley last Tuesday as midweek defeat at Chorley as Adam Sumner and Caspar Hughes came into the defence in place of Dom Collins and the suspended Josh Langley. Sumner slotted in at left-back as Stephen Crainey moved inside to partner the outstanding Tom Hannigan at the heart of the Coasters’ defence. Finley showed an early sign of intent for Fylde as he tried his luck inside 15 seconds but his long-range effort flew harmlessly wide. It took until the 17th minute for the first genuine chance of the match. Danny Rowe won possession from Paddy McLaughlin and Charles picked up the loose ball but his low strike was saved by Russell. Gateshead then began to threaten and were almost gifted the opener. Caspar Hughes needlessly kept the ball in play only for CJ Hamilton to take possession and burst into the Coasters box. Thankfully for Fylde, Stephen Crainey was well positioned to clear the danger. Fylde should have taken the lead on 26 minutes. Sumner delivered a fierce free-kick into the Gateshead box and found the head of Hannigan but the skipper’s close- range header was straight at Russell. As the game became stretched, it was Gateshead’s turn to threaten with a header but Ramshaw’s effort floated high and wide of Matt Urwin’s goal. Fylde then went close as Charles’ pass split the Gateshead defence but Finley’s bobbling shot went inches past the post. Finley connected much more sweetly with his next effort but the low volley from a free-kick was comfortably gathered by Russell at his near post as the first half drew to a close. As in the first half, Fylde chanced their arm within a minute of the restart as Danny Lloyd, under pressure from the home defence, fired a wild volley well wide. There was a brief moment of panic for the Coasters just before the hour mark, when Hamilton’s cross-shot was fumbled by Urwin but Bowman was unable to turn in the rebound before Sumner leared the danger. Gateshead then spurned a glorious chance to break the deadlock. Josh Gillies burst forward and crossed to the unmarked Bowman but his first touch took him away from goal. Bowman’s shot on the turn from eight yards then flew wide of Urwin’s top left corner. The pressure was building from the hosts and they took the lead on 73 minutes. Ramshaw drove to the dead-ball line and his cross was deflected straight to Bowman, who headed in from close range. There was almost an immediate reply from Fylde as Finley broke into the box but his low shot was deflected on to the roof of the net by Gateshead’s half-time substitute James Curtis. Gillies nearly added a second in stoppage time but his whipped effort was comfortably gathered by Urwin. Danny Rowe also sent a late effort well wide for the Coasters, whose sole focus will now be on gaining promotion to Gateshead’s division. 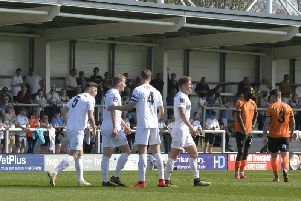 AFC Fylde manager Dave Challinor was proud of his players’ efforts at Gateshead and felt there was little to choose between the sides. The Coasters boss said: “I don’t think there was a massive amount between the sides. “They changed their system after the break, and stopped us getting out and being able to play. Their goal didn’t come from a particularly good piece of play – it was just from some sustained pressure. They never really ripped us apart at any point. “They kept us penned in and I guess that’s the difference between the levels. We know the areas we need to improve to compete at a higher level. “We need to evolve and develop, and I’m sure we can with the personnel that we have, but against the better sides we need to learn how to release the pressure. “I thought we were very comfortable in the first half, and most of the chances and attempts on goal came our way. It was credit to ourselves that they had to change their system. “You are never going to be on top for a full game, especially against a team in the division above. We have been punished for not taking one of those chances when we were on top. “Gateshead are experienced and are on a very good run at the moment, but in all honesty the game could have gone either way. AFC Fylde: Urwin, C. Hughes, Crainey, Sumner (Whittle 82), Hannigan (c), Barnes, Charles (Hardy 82), Finley, Rowe, M. Hughes, Lloyd (Blinkhorn 82). Gateshead: Russell, Clark, Ramshaw, Shaw (Curtis 46), Gillies, Mafuta (Chandler 65), Bowman, McLaughlin, Hamilton, Whitmore, Bennett.